I think the problem here is that Kripp simply decided to make a video highlighting his first Arena run of the expansion and Bizzard made a big deal out of it. Don't think Kripp really intended the vid as an introduction to the new Arena. Thief Rogue keeps transforming from meme into dream. I don't regret crafting golden Tess Greymane (even though her animation is horrible). It's the 1st of April for me already, so I'm having a pretty hard time figuring out if the fact we're getting this for free is an April Fools joke. ...whereas Possibility Seeker knows mistakes are possible to be made by all of us. As far as I know, Squirrel Whisperer was revealed by accident. 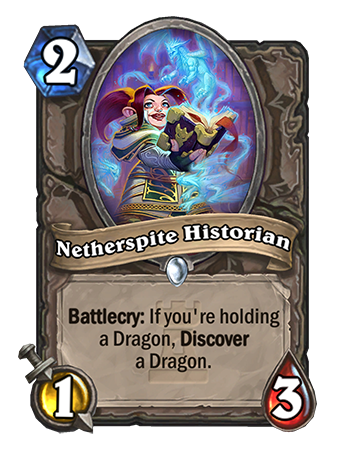 By the way, surprised no one's comparing her to Ravencaller. They are quite similar. We don't need another Fungalmancer. Because it doesn't need to deal excessive damage? We are gonna be rich! And you are gonna be rich! Everybody is gonna be rich! You smell like a Clockwork Gnome! This on T1 into Faceless Lackey summoning Millhouse Manastorm on T2. Can damage a damaged minion? Surely not a rogue card? Hi'Reek buff, good luck with it, Blizz. But not bad for zoo, and like was before, handbuffs are awful, i don't think this card will help. Yeah, it's just that this is not a handbuffing card. It's not a true expansion without an unplayable hunter legendary. GalSawyer posted a message on Choose Your Champion Packs Have Arrived! Dunscot posted a message on Ben Brode Answers Your Hearthstone Questions and More! Ben, I love you man, but some of this is just... dumb. You might consider adding Wild Sets to the in-game store, someday in the far future?! JUST DO IT! You don't lose anything. You might have to update the interface a bit, maybe figure out how to list an ever increasing amount of sets without it getting hard to navigate, but just saying "we don't feel like it" and effectively keeping all Wild sets behind a paywall is stupid. Even moreso, when you have said, not even a year ago, how important Wild could be to keep the game fresh and interesting, when Standard is in a critical spot. And no, "just craft old cards" is not a reasonable answer. 20 commons and 16 rares from GvG for 2400 dust is a terrible, terrible deal. Spending 1600 dust on Reno Jackson alone instead of 700 gold + getting a bunch of other cool cards is also a terrible, terrible deal. It only makes the mode more exclusive and hard to access than it already is. Also, if you despise Classic so much except for the "theme", just give it up already. I know that you are concerned with Standard changing regularly, but if you are so anxious that a card from Classic might ever be too influential, that you can't even figure out how to replace cards you remove, just dump the entire set and be done with it, instead of nerfing/rotating another few cards every year until there is nothing left. I don't even get what your big concern is. Most of the Classic set is either intentionally weak, outdated, nerfed or just situationally useful, pretty much the way you want it to be. There are a few remaining strong cards, that are utilized in many decks. So, either stay true to your word that the core set should feel like a solid basis and deal with it, or remove all of them. This "we might nerf/rotate some more" every half a year is really getting annoying. Even if Classic were still the best set all around, it is nowhere near as influential anymore as it was a few years ago. You release 3 expansions per year, and all of the last few were very strong, very influential, and have changed Standard and Wild massively. We are really beyond the point that every deck consists of 20 classic cards, and the few decks that do are almost always Hunter or Mage decks. Give these classes some reasonable alternatives and choices, and they will stop using Eaglehorn Bow, Animal Companion, Unleash the Hounds, Fireball, Mana Wyrm etc. in every deck. And finally, there is a big difference between "buffing" cards and putting them on the powerlevel of, let's say, Voidlord or Call to Arms. Just as there is a big difference between "balancing" a card and giving us Warsong Commander. I think there is PLENTY of space inbetween, and you know, even if you ever made a card a bit too strong by accident, it's a DIGITAL card game. You can change it back. You can change it as many times as you want. Aside from that whole multiplatform update approval issue, try to be a bit more adventurous instead of looking 3+ years ahead for every minor thing. I'm not suggesting to be like the Gwent team that had changed Restore like 3 times in less than 4 months, but don't be like "Oh no, if we give a card a little buff now, it could be too good someday if we ever wanted to do this or that". 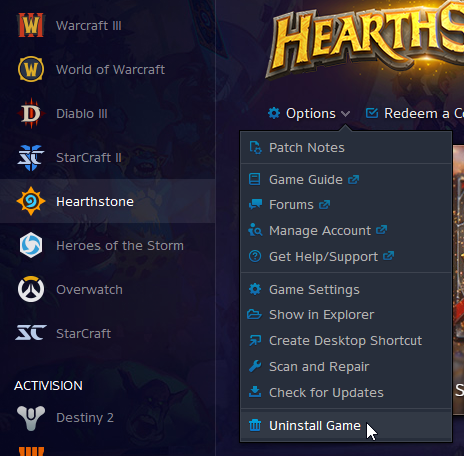 Blizzard should make more hype about this than last time. Like make it possible to buy wild cards in the normal store, and give all players one of each wild card pack.